Freeliveyoung.com - 4 Ways to Know the Type and Capacity of VGA Computers - VGA (Video Graphics Adapter) is one of the most important components on a computer where it is this component that translates digital signals from a computer to screen into a graphical display. In addition, called the VGA component is also commonly referred to as a graphics card (Graphic Card). For game enthusiasts (gamers) this component is one component that is very important because by using a VGA that good graphics display games will be better especially for high-resolution games (HD). But if you want to replace the VGA, of course, you have to consider it first with the size of the monitor screen, power supply and other components used on the computer in order to run properly. In addition, each game also requires different VGA capacity the better the game graphics are played then the higher the VGA needed. If the VGA you use to play games is not appropriate or lower with the needs of games that are played usually when the game is played will be dashed. Therefore we must first check the capacity of VGA computer that we use before playing the game. But there are still some people who have difficulty to know, but there are many ways that can be done to determine the capacity of VGA computer, this way you can also use to know the type and capacity of VGA on laptops and notebooks. Of course by using the way I will share this we do not need to disassemble the computer because we will see it directly in just a few steps just use the features available on Windows or with the help of additional software. There are several ways you can check your computer's VGA capacity all of which you can use on a computer that uses the Windows operating system. So you do not get confused please choose one of the ways below which you think is easiest to do. CPU-Z is a third-party application that you can use to check full computer specifications, so by using this application you not only can see the type or capacity of VGA only but all the computer components you can see. This application is also shared free by developers CPUID and can run in all types of Windows including Windows XP, Vista, 7, 8, 10. Please download first through the official website at CPUID.com. On the page there are two types of applications that you can download the first portable alias does not need to install in ZIP format ( ZIP • ENGLISH ) and there is also in the install the format. Exe ( SETUP • ENGLISH ). Please select one, then open the app. Then it will appear your computer specifications, like the picture below I use the portable version to see the VGA in the Graphics section. 1. In the initial view of Windows or desktop press the Win + Run button then on Run feature write dxdiag then press Enter or select OK if the dialog appears just select OK.
2. 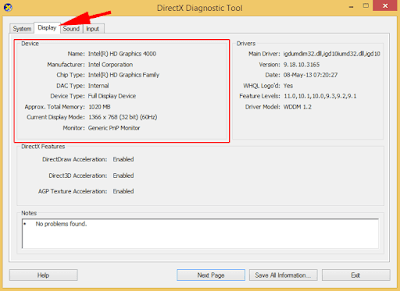 Automatically will appear DirectX Diagnostic Tool there is part System, Display, Sound, and Input. To view VGA select Display it will show the type and capacity of VGA computer that you use. For the third way is the same as the second way in which we take advantage of features that are already available in Windows, but there are slight differences in steps here I use Windows 8.1 for you who use other Windows version please adjust. For Windows XP users right-click on the desktop then select Properties select Advance, look at the Adapter section there will see the VGA specification used on your computer. The fourth way is no less easy in a previous way but in this way, you can only see the VGA type it just does not look complete information. But with this way you can find out whether the VGA driver is already installed or not. Please see the steps below. 1. Right-click on the Start menu and then select Device Manager after that see on Display adapters then there will see the type of VGA that you use, if the driver is not installed there will appear a yellow exclamation mark. For Windows XP users how to right click on My Computer then select Manage, later you will automatically be directed to Computer Management more or less looks the same as Device Manager in Windows 8. Please choose one way from the four ways above that you think the easiest if you think the VGA you use is still not qualified and not satisfied with the now used You can buy a better VGA in order to run high-resolution games. 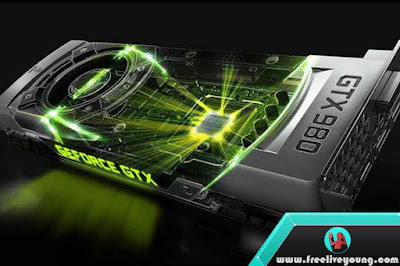 If you already know the VGA capacity of your computer must also consider the software or games that you play must be in accordance with the needs of the game or software is usually on each software will display the different System Requirements more sophisticated the higher the computer components needed. Do not force if the computer you use does not comply with System Requirements because it can make your computer device quickly damaged, play games that match the capabilities of the computer you use. Thanks for reading 4 Ways to Know the Type and Capacity of VGA Computers, Laptops, and Notebooks.